1. Cut white strips of paper about 3/4" to 1" wide. 2. Roll each strip into circles, tape to secure. Make some circles big and some small. 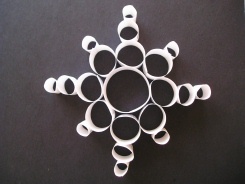 Glue your circles together to make your own unique snowflake. Make a bunch of these snowflakes and string them with yarn or twine, they make a great winter decoration for the home or classroom!